I’ve been wearing a lot of dainty pieces from Gorjana lately (which I love! 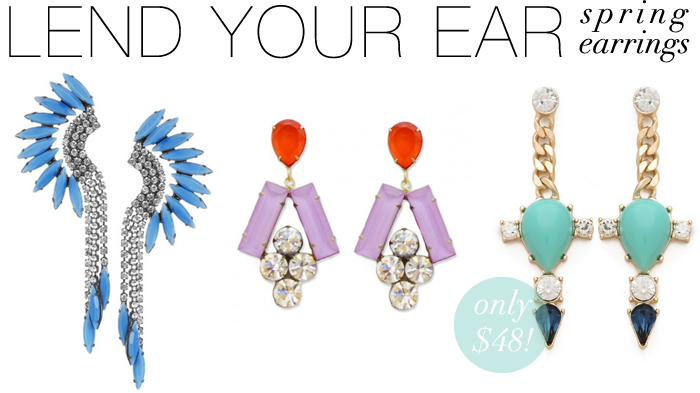 ), however I think I’m also in need of some bright earrings for spring/summer. The first pair (far left) is by Elizabeth Cole, who I discovered is discounted in a ma-jor way on The Outnet this way! Who would ever think mohawk earrings could be so chic? The lilac and red pair is by a new-to-me designer, Loren Hope. Her pieces are colorful and totally glam, but the prices don’t make you cringe (I still tear up when I realize I can’t afford every Dannjio necklace). These earrings are $68 – so amazing. The last (and most affordable) pair is by a personal favorite, Club Monaco. That chain + navy and turquoise color combo give these earrings a cool nautical vibe. And only $48? Total. Freaking. Steal. You’re welcome. Literally just bought those Club Monaco ones yesterday using a ShopBop gift card I had – love!! I’ll take all three – they’re all such great picks! Love! I want these Loren Hope earrings in my closet immediately. LOVE all your picks.